According to Energy.gov, you should start considering replacing your boiler if it’s more than 15 years old. But if you’re smart, you won’t just pay attention to your boiler’s age but also other signs that you need to replace it. Let’s take a closer look at why each of these signs indicate that you should replace your boiler. See the signs and need a quote for your boiler replacement? Just contact us for a fair price. If your boiler requires one or more repairs every 6 months, you probably should just replace it at this point. Why? Well, as boilers experience wear and tear, all the components of the boiler are more prone to breaking down. And if you’re experiencing more and more repairs, at some point you need to ask yourself if it’s still worth it to pour money and time into a dying machine. Think of it this way: The average boiler repair in our area is around $400. And let’s say your boiler starts needing multiple repairs every 6 months. The repairs quickly reach over $1,600 in just one year’s time. Instead of wasting money on a boiler that’s likely going to die in the next year or so, you could put that $1,600 toward the cost of a new boiler instead. As boilers age, they have to work harder to produce the same heat output. For example, according to Energy.gov, scale buildup can force your boiler to consume up to 7% more fuel to produce the same amount of heat. Which means your monthly utility bills will see a 7% increase as well. You see, over the years, boilers inevitably accumulate a layer of scale on heat transfer surfaces from dissolved minerals in the water. This scale acts as insulation and reduces the amount of heat that can be transferred to the water (and ultimately to your air). So your boiler is forced to consume more fuel than it used to, just to keep you comfortable. 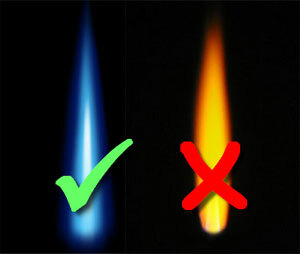 If you notice that your boiler burners are putting off yellow flames (instead of blue), it means your boiler’s fuel is not burning properly and you should replace your boiler ASAP. Why? Well, if the gas in your boiler isn’t burning correctly, it will burn yellow and form carbon monoxide—a colorless, odorless gas that is lethal at certain levels. But even at lower levels, carbon monoxide can cause headaches, dizziness, upset stomach and chest pain. So what’s causing the gas to stop burning properly? Well, over time, dirt and soot can clog up your boiler burners which won’t allow the proper mixture of gas and oxygen, which leads to “incomplete combustion” (yellow flames). As your boiler ages, it will most likely start leaking water at some point. And eventually, small leaks can develop into bigger leaks that can cause costly water damage. If you have a small leak in your boiler, it’s a sign that you should replace the unit. Most likely, if the metal in your boiler is weak enough to produce one leak, it will produce others. If you think you’re in the running for a new boiler, just contact us. We’ll send a professional out to assess your current system and provide a fair quote.